Enjoy the benefits of working out in nature while accessing a physical fitness trainer – on your time without the cost of personal trainer or the hassle of making an appointment. 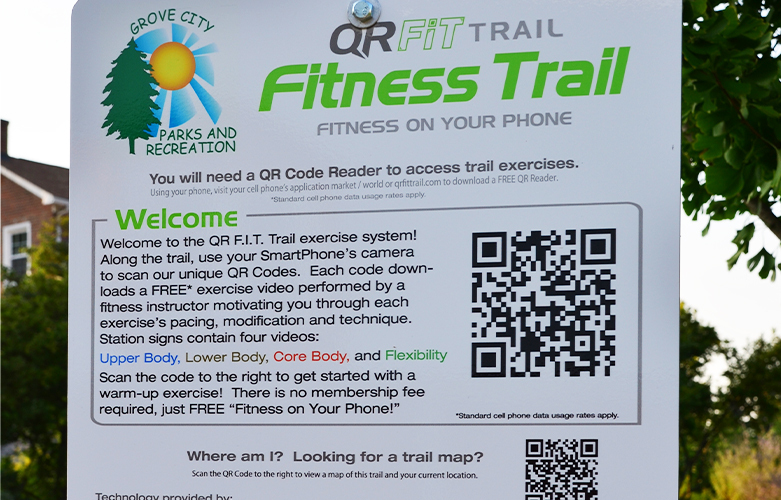 The QR Fit Trail experience is now offered at Fryer Park, 3899 Orders Road, and Gantz Park, 2255 Home Road. The system in each park includes a welcome station with a warm-up exercise and additional five workout stations marked by signs along the path. Each sign features multiple Quick Response (QR) codes for smartphone users to scan and download a minute-long video of a fitness trainer illustrating a specific exercise that coordinates with the physical attributes of the space; no additional fitness equipment is necessary. A user scans the QR code and downloads videos of fitness routines that fit with that person’s workout goals and fitness level. The person views a videos featuring proper execution of an exercise focusing on upper body, flexibility, lower body or core, then perform that exercise. Each month, new videos are linked to the codes on the signs to keep the experience fresh and invigorating. The QR Fit Trail system currently includes 150 different workout videos. Developed through a partnership forged in 2011 between a technology expert and a certified physical fitness instructor who represented the United States internationally in Australian rules football, QR Fit Trails works from the premise that America’s obsession with smart phones can work in unison with the benefits of exercising in nature to achieve greater fitness and health for everyone. The service is free, but users must have a QR or barcode scanner application downloaded on their phone, a variety of which are available via free download for different operating systems. Grove City Parks and Recreation continues to explore emerging technology and other ideas that support the mission of safe and enjoyable environments and high-quality, innovative and cost-effective programs. For more information on this and other programs, visit www.GroveCityOhio.gov or call 614-277-3050.